Maia: I’ve been throwing comic cons for about five years now. I started out by partnering with another local convention. After about five years, I decided that it was best if I used my experiences and start my own. This will be the second year of MECCAcon. I’ve networked very heavily with artists, writers, and publishers for years, so my connections were very beneficial. I try not to piss people off, so it works in my favor in the long run. I’ve also thrown art installations for years as well, so it all ties together. I’m also a poet who has retired her pen. I’m just your average Detroiter trying to do 99 projects with 99 cents. And I’m a mama of a soon-to-be 16-year-old who lives for all things black indie comics. He helps me keep up. What are you into and how did you get into it? Maia: I’m actually honestly into all of it: comics, science fiction, speculative fiction, afrofuturism, steampunk, etc. OK, well, not all of it – I pass on anime. (It might be illegal to say this because I swear every time I get interviewed, they pass out and are ready to plaster me with scarlet letters). Other than that, I truly love it all. I’ve been a bookworm since childhood. My mother would tell me it’s time for bed. Ten minutes later, I’m under the sheets with a flashlight. My parents would end up ordering almost every book in the Scholastic book pamphlet. As far as comics are concerned, I’ve been known to root very hard for all things indie. If it’s mainstream, it’s mostly Shaft. (In my heart, I’m in denial. I say to myself that Shaft is still indie. LOL) I dibble and dabble in a few mainstreams, but 95% of my collection and my son’s don’t come from Marvel or DC, etc. My son is a huge fan of Black Panther, Blade, Vixen, Storm and Cyborg, though. I’m very excited about the upcoming new Cyborg relaunch with David Walker. Why did you start the Midwest Ethnic Convention for Comics and Arts? Maia: I wanted to contribute art to the children of the Metro Detroit area. Many have absolutely NO idea that there are heroes that look exactly like their fathers, their mothers, their aunts, their uncles, their cousins, and even themselves. They have never seen them, never read them, and definitely never owned them. It is amazing to see the babies running over each other and losing their minds from table to table! I’ve been knocked over once and I almost started crying! It was beautiful. That means more than anything else. I love Detroit, I love being Moor, and I love art. I wanted to do something that would mix all of those things in a bowl, and benefit my community in the process. Detroit had already had a black comic con. That’s great. I wanted an event that would highlight art as a whole…not just comics. I wanted it to be culturally and artistically inclusive. We have so many outstanding visual and fine artists, it’s overwhelming. Detroit is also a historic melting pot. That’s what the city was built on. When folks say we are “built Ford tough,” we don’t take that phrase lightly. We are full of culture and arts; it’s what we do. With that said, art is also a huge medium of gentrification. People who gentrify communities hit the art scene first, and boy, do they hit it hard. Galleries, museums, pop ups, coffee shops, restaurants…bam! Down goes Frazier. You never know what hit you. Three years later, your community is no longer your community anymore. The media tears down Detroit for propaganda. Folks who are in the art community here know how much Detroit is really thriving. People from all over the world are being paid to move here. There are galleries and museums everywhere you turn. But the news will never let you know that. So I decided to utilize my connections and resources and try to make an event that would do something differently. 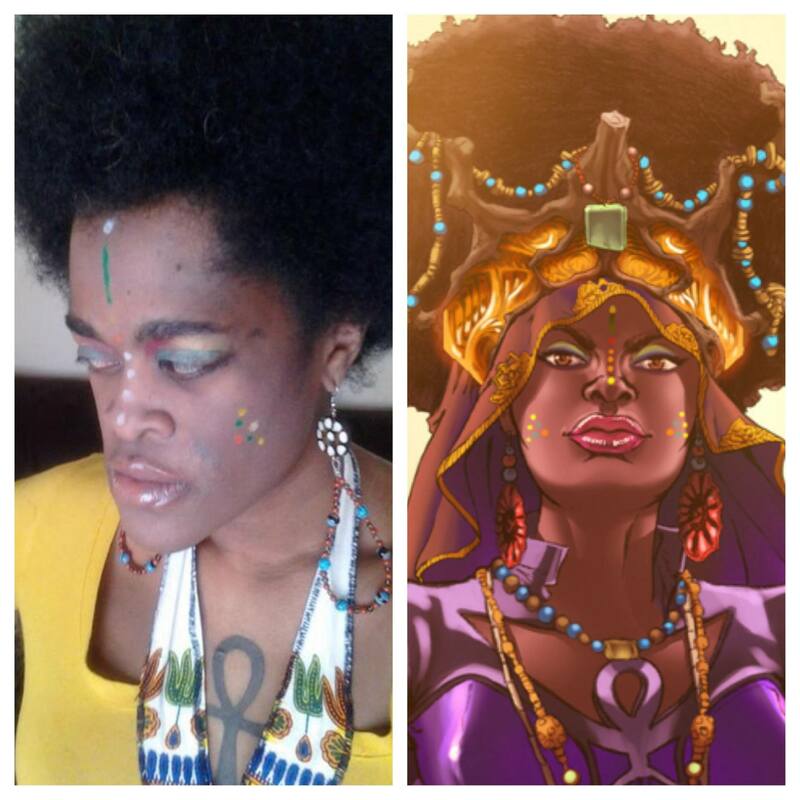 I wanted to not only focus on comics and a few performances, but highlight art and community involvement as a whole. I wanted it to be family friendly and educational. I sat down and talked to artist Shawn Alleyne one day, and we decided together to name the convention MECCAcon. We came up with the entire concept together, acronym included. What kind of response have you gotten from the comics community? Maia: Oh, boy. I’ve gotten major support from my peers. People have been very proud of what I’ve accomplished, and even more of what I’m trying to accomplish. Artists, writers, publishers and collectors have all rallied behind me, and want to see me do well and be successful. It means the world. Shawn Alleyne, Jason Reeves of 133art, N Steven Harris of NS WORKS, and Regine Sawyer of Women In Comics NYC International are my biggest supporters. I also give major praise to Erika Freeman of Dark Matters Project, Joe Illidge, Dr. Sheena Howard, Michael Davis of Milestone, and so many others. The support I’ve gotten from them has been absolutely amazing. I wouldn’t survive out here in this comic world if it wasn’t for them. Lots of the old school DC and Marvel comics that feature black superheroes give those characters Detroit roots. What do you think that meant at the time (1940s-1960s)? If there are/were black superheroes coming out of Detroit now, what does being from Detroit represent now? Maia: Well, when it comes to my favorite Detroiters, it would be Cyclops, Deathlok and Vixen. DarkSeid basically brought all the hell here! I believe that those characters probably had a pretty damn hard time, you know? ESPECIALLY in the ’60s. I also believe that Cyclops was probably a huge jazz head, and hung out in the Black Bottom/ Paradise Valley with Steel. Deathlok probably enjoyed black burlesque. Vixen and Dale Gunn probably had summer homes in Idlewild (for those of you who do not know, the movie was actually based on a place here in Michigan – not Atlanta – that was basically a black Martha’s Vineyard, where all black celebrities, doctors, musicians, etc., owned second properties and vacationed). In the ’60s, Black Power reigned and I’m sure DC and Marvel made note of it. Blade chilled here, too. I can see why we were such a prominent location to base stories and characters on. Dakota City (Milestone Comics) is based on Detroit; co-founder Dwayne McDuffie was from Detroit so we have a very strong foundation. If characters were created now, I believe they would represent adversity and advancement in the community. I believe they would be about environmental and social activism, and they all would be urban farmers! Our city is rough but gorgeous…like a butterfly with bandaged wings. Why focus just on indie comics? Maia: I’m always representing for the independents. They don’t get their proper due. I also put my money where my mouth is and have receipts to prove it. Yes, I like a few mainstream [comics], but the way Storm got passed around like Olivia Pope makes me want to just be like, “Eh, let me just cop Concrete Park instead and see what they’ve been up to. Let me see what’s going on these days with Watson & Holmes. Maybe I should catch up on Miranda Mercury, Bounce, Eating Vampires, Malice in Ovenland or Kid Code.” I completely support indie EVERYTHING. How do indie comics improve the overall comics landscape, particularly among consumers of color? Maia: Easy. Self ownership and cooperative economics. Create that POC dollar, and return that POC dollar right back. It’s also very important that we create our own stories instead of whining about how others aren’t doing it for us. Marvel and DC don’t owe us a damn thing. Never have and never will. But if one day I wake up and Griot Enterprises, Lockett Down or Rosarium aren’t representing “my blackness” the way I feel they should, then I will have something to say. But knowing Jiba Molei, Regine Sawyer and Bill Campbell, I highly doubt that will ever happen. Diversity is key in all forms of art. I wish in the future to introduce myself more into the Asian diaspora of the comic book industry. I won’t say it doesn’t exist, I wish to find them. One thing in America that is a huge problem is that everything is black or white. I would love to support comics from our indigenous people PERIOD. DEETS: MECCAcon2015 is Sept. 19 in Detroit. Applications are now being accepted. Vendor/artist registration is only $75 (first come first serve). Please send inquiries to AmonyetEnterprises@gmail.com. This is a family oriented event. All are welcome. Maia is currently have a t-shirt crowd funding campaign with limited edition tshirts from artists including N Steven Harris, Shawn Alleyne, Jason Reeves and Khary Randolph. Donations are being accepted via PayPal: crown7176@gmail.com. All proceeds go strictly to organizing the convention. Maia also does a weekly feature, #MECCAconWeekly, where she highlights comic book artists, actors, filmmakers, writers, authors, publishers, artists and more. You can find it on http://MECCAcon.wordpress.com. Shout out to Aiesha Little over at #MBSFA ! Thanks for the opportunity for #MECCAcon2015 !